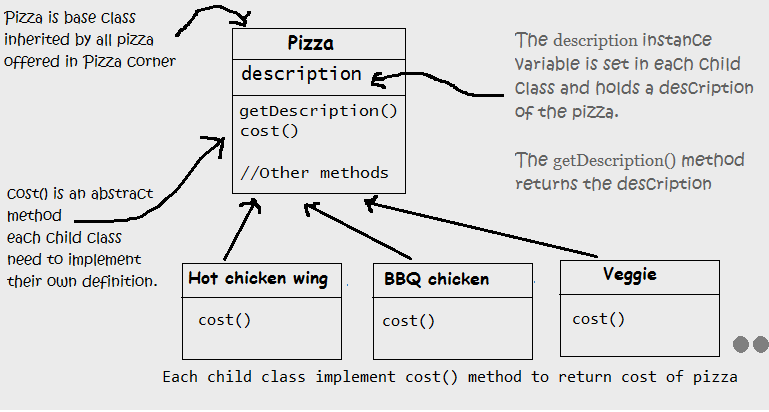 Decorator Pattern is a design Pattern that allows to dynamically add behavior to an existing individual object without making any code changes to the underlying classes. 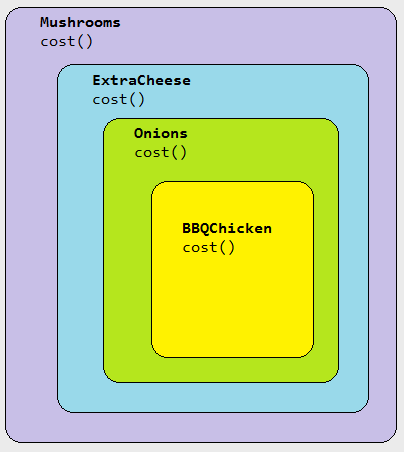 It is a flexible replacement to sub-classing for extending functionality to an object. If you think inheritance is everything than decorator pattern helps you to learn the power of extension at run-time instead of compile-time. Let's try to learn and implement decorator pattern on a problem. Pizza Corner growing restaurant chain around. Because they have grown, they’re trying to update their ordering systems to match their Pizza offerings. While starting their business they created their classes like this. Other than regular Pizza, you can ask for several pizza topping options like Bacon, Black olives, Chicken, Extra cheese, Mushrooms, Onions, Sausage and much more. Pizza Corner charges for each of these topping, so they want to add these into their system. 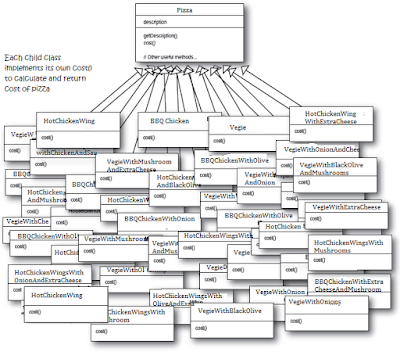 First implementation of adding new abilities in system team created a child class for each pizza with each topping option. So first implementation looks like. If your first thought was also to use inheritance for this problem then you are incorrect. 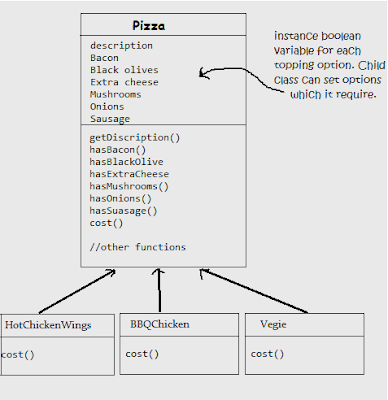 What if Pizza Corner started offering more toppings or added new pizza type you have to add all combination of classes in a system which will become hard to manage. Developer team realize that this subclassed solution is not going to work and its actually a bad design so they started redesigning the system. 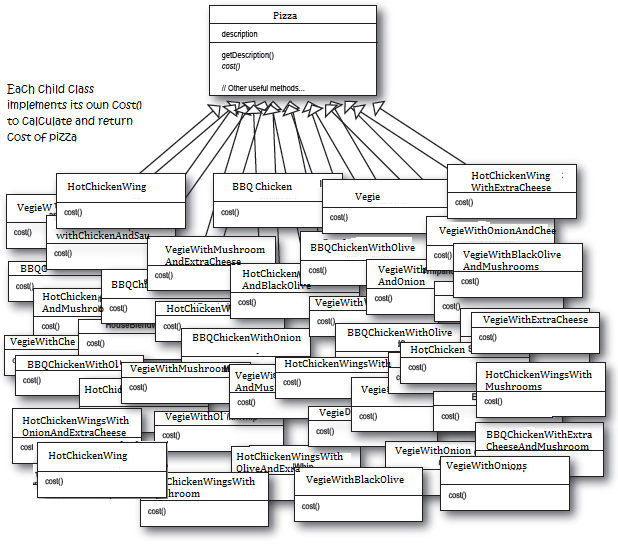 Now they created instance variables for each topping option in the base class. So each child class can set options which it required. 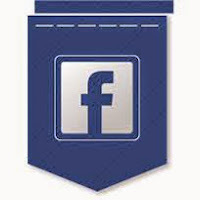 for an extension, but closed for modification." As whenever a new topping option will be introduced we need to modify our base class which is not correct. As we have seen different approaches for our problem at Pizza Corner which have not work out very well. Let's implement Decorator Pattern in this problem. For decorator pattern we take our pizza type object and than decorate it with different toppings. Lets say we got an order for BBQChicken with Onions, ExtraCheese and Mushrooms. Decorators object should have the same base type as the objects they are decorating. We can use more than one decorators to wrap an object. Given that the decorator has the same supertype as the object it decorates, we can pass around a decorated object in place of the original (wrapped) object. 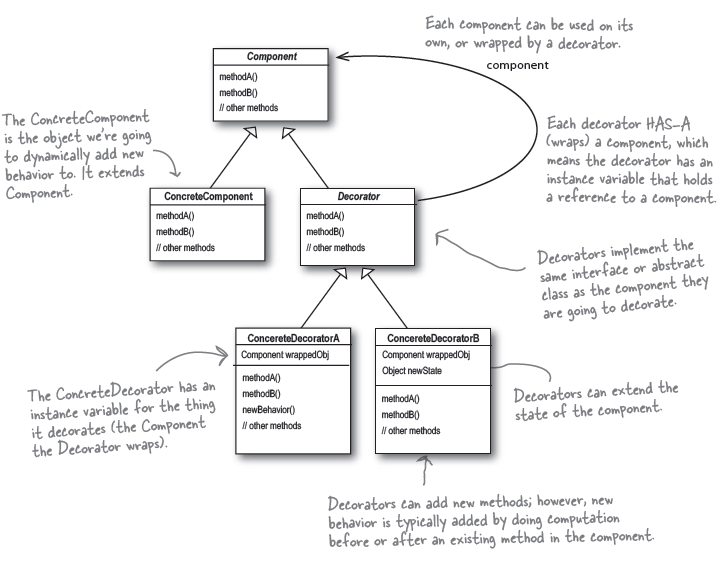 The decorator object apply its own behavior either after or/and before delegating to the object it decorates. We can decorate objects dynamically at runtime with as many decorator as we required. 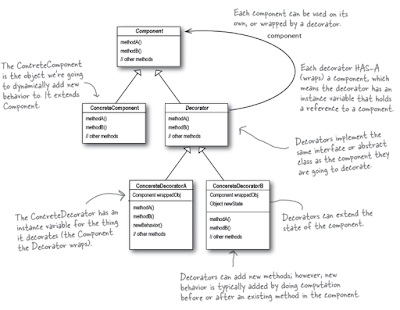 Here is a diagram which shows the design of decorator pattern. We have to implement this design for our system. 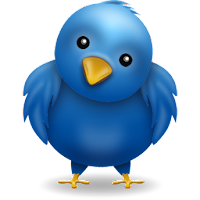 I am going to implement it in C# language. Our base class of Pizza which will be inherited by all pizza types and toppings. Here are our concrete components classes for each pizza type. Each concrete components will set is own definition for cost method and set description. We have implemented our base topping decorator class, lets implement decorator class. 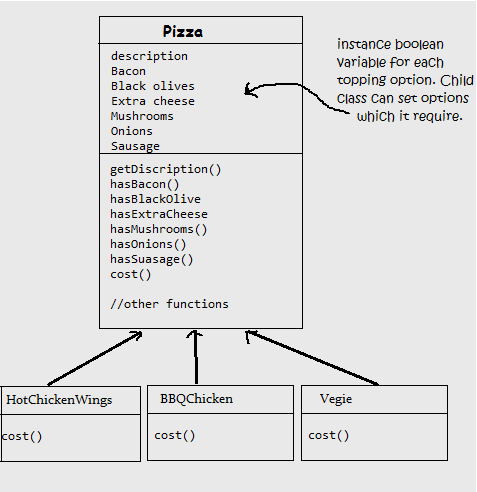 As we have implemented decorator pattern for Pizza Corner lets serve some order of pizza and see how its going to work. 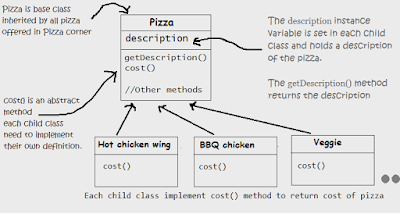 We have implemented Decorator Design Pattern which add behavior to an existing object without making any code changes to the underlying classes as you notice its follow the design principle of "Open for an extension, closed for the modification" Now if Pizza Corner add any new Topping serving the need to extend the system by implementing new decorator class and no need to existing system. If you have any question or feedback please post in comments.